Yesterday I shared my experience, and some tips I picked up, while attending a Nikon School course on travel photography recently. For someone who travels frequently and loves to take photos, that was an enriching opportunity to say the least. In addition to inviting me to sit in on the course, Nikon also loaned me a D7500 DSLR camera to use during the class and on some of my adventures, and while I was perfectly happy with my older Nikon DSLR, I now find myself wanting to upgrade to take advantage of the fantastic features that his camera brings to the table. The D7500 is equipped with all kinds of modern photography technology. For instance, it features a 20.9 megapixel DX sensor that captures outstanding image quality and offers beautiful color reproduction. It is capable of shooting as many as 8 fps in burst mode, and has a wide range of ISO settings, starting at 100 and going as high as 51,200. That translates to excellent low light performance, without producing too much grain in the images. A 51-point autofocus grid allows the camera to lock on to subjects quickly and accurately, while the D7500's processing engine was even efficient in handling RAW format photos. Of course, this being a modern DSLR, it also shoots outstanding video as well. 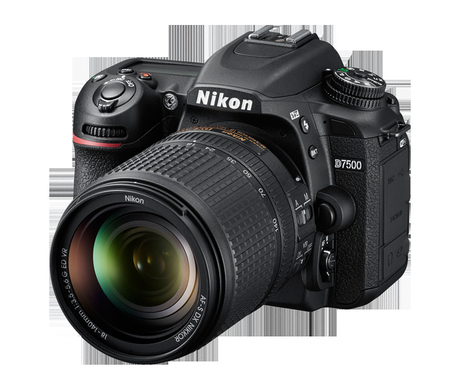 The D7500 is capable of capturing 4k video at 24 fps or 1080p video as high as 60 fps. That makes this a workhorse camera that can shoot both video and still shots with ease. It even has built-in pro-level tools like power aperture controls and the ability to refocus the lenses through a touch control. Time lapse videos are a cinch to shoot too and video can even be captured in MP4 format for quick playback and editing on smart devices. Other nice features that I really appreciated were WiFi and Bluetooth connectivity that made it easy to share videos and images with a smartphone or tablet, a tilting touchscreen for fast navigation, and a rugged body that felt like you could take it just about anywhere. Battery life is rated for up to 950 shots between charges, and I found that to be fairly accurate, even when using the camera in extremely cold conditions. As previously mentioned, I own an older Nikon DSLR camera that has served me well for a number of years. It is rugged, reliable, takes great photos, and has been with me on adventures to nearly every corner of the globe. Until now, I really hadn't thought about replacing it, but the D7500 has convinced me it may be about time. What has changed you ask? Well for starters, the speed of this camera is just incredibly impressive. The autofocus locks on very quickly and the camera itself is impressively responsive when shooting photos. With the D7500 I don't feel like I'm going to miss an amazing shot because my camera can't keep up with the action. Quite the contrary in fact, and I found myself shooting photos with much more confidence. I took this camera with me on a trip to Arctic Europe a month or so back and was incredibly impressed with how well it performed in the outdoors. Temperatures often hovered around -40ºF/C and yet the D7500 still happily snapped photos when ever I needed it too. Even in the cold conditions it was extremely snappy, when I knew my older model would have been much more sluggish. Image quality is fantastic with the D7500 too, even in an environment that was often washed out with bright sunlight bouncing off white snow. The colors captured by the camera are crisp, clear, and true to life, limiting the amount of time I had to spend in post production. The camera was even able to capture excellent photos of the Northern Lights without the need for a tripod. Had I tried the same thing with my older model, everything would have been a blurry mess. As you can no doubt tell, I'm extremely happy with this camera. That said however, there are a few areas that I'd like to see improved on potential future models. For instance, it only has one card slot and would have preferred if it had two. Two slots makes it easy for photographers to make back-ups of course, but I also like to separate my still photos from my video, and being able to save them to different cards would have been nice. The LCD screen on the D7500 could use an upgrade to a higher resolution too, although it was generally adequate for what I needed to use it for. Serious filmmakers may want better built in tools as well, although they were fine for my needs. All things considered, the Nikon D7500 is one of the best cameras I've come across for the money. The body alone will set you back $1249.95, although my test model came with an 18-140mm VR lens, which typically runs $1749.95. I loved the versatility that the lens brought to the table, although Nikon offers several other Kit lens options as well. In my line of work I'm often given sample gear to test and keep after I'm done using it. That wasn't the case with this camera, and I have to admit I was reluctant to send it back. It was such a joy to use in the field and it truly turned a spotlight on the areas that my current camera equipment is lacking, most notably in the speed department. I truly appreciate Nikon spring this model with me, but now I know that I'll be shopping for a new DSLR sometime in the near future. If you're serious about your photography, you'll want to have the D7500 on your list too. It is a lot of camera for the price and anyone short of a full-time professional photographer is likely to come away very happy to have this model in their own gear closet. Find out more on Nikon's website.